Twin cylinder horizontally opposed engine with single magneto. Serial No. 26332. Immediately post-World War 1 several of the English aircraft manufacturers began to design small aircraft with a view to developing a leisure market in consideration of the number of trained pilots returning from the war. These aircraft were to be economical with engines around 40-50 horse power. Several aircraft engine manufacturers began or had been producing low powered engines that would suit these airframes. By way of a few examples, ABC of Walton-on-Thames produced a horizontally opposed twin cylinder engine of 40 horse power they christened "Gnat", British Anzani of Kingston-on-Thames produced a 45hp six cylinder radial, Green Engine Co. Ltd. of London had been producing 4 cylinder in line engines of 35-60hp from about 1909 and Armstrong Siddeley Motors Ltd of Coventry entered this market near the end of 1919 with a horizontally opposed twin cylinder engine using cylinders from their Jaguar 1 radial. This engine they called "Ounce". According to one author the "Ounce" was originally a cylinder test rig that "...did so well the Air Ministry ordered a small production run...". One thing seems certain; the production run was small. Only two aircraft types in Great Britain seem to have used the "Ounce", the Bristol Babe and the R.A.E. Aerial Target. While the evidence indicates that the Babe did not fly using the "Ounce" fitted to the 1919 Paris Show display aircraft the case of the R.A.E. Aerial Target suggests that possibly ten aircraft were fitted with the "Ounce" engine. It is supportive of the notion of the "small" production run that the Museum's "Ounce" appears to be the only survivor. The information regarding the import of the engine into Australia is unknown. It seems that it was not in Australia for the Low-powered Aeroplane Competition held at Richmond Aerodrome from November 29th to December 8th, 1924. The imported engines used were 2 geared Anzanis, 1 ABC Scorpion and 3 Blackburne Tomtits; all imported from England. However, an advertisement appearing in the Australian magazine "Aircraft" for February 1939 lists a "little used" 45hp twin cylinder Armstrong Siddeley aero engine for sale by D. Power of Margaret Street, Toowoomba in Queensland. In December 1941 in the magazine The Air-Log a letter from Ronald Clarence Blanch, a dairy farmer of Woodford Leigh on the Clarence River in northern New South Wales, details his construction of a Clancy Skybaby aircraft using "...a 60hp horizontally opposed twin Armstrong Siddeley engine...", undoubtedly an "Ounce". Apparently this aircraft was dismantled some time in the immediate post war period. Considering the rarity of the "Ounce" it is probable that this is the Museum's engine. It is supposed that, Blanch bought the engine from Power. 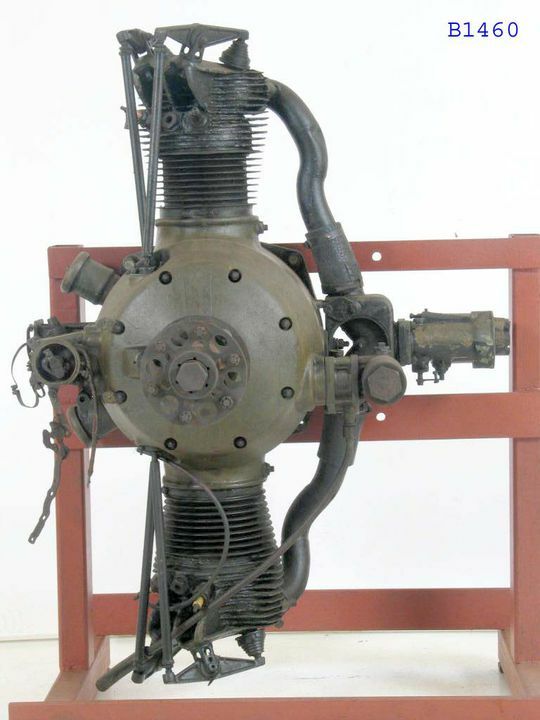 After the dismantling of the Skybaby the engine was sold and found its way to Sydney and the owner later donated the engine to the Museum.